While immunization coverage rates for childhood routine vaccines in Hong Kong are almost 100%, the uptake rates of optional vaccines remain suboptimal. Understanding parental decision-making for children’s vaccination is important, particularly among minority groups who are most vulnerable and underserved. This study explored how a subsample of new immigrant mothers from mainland China, a rapidly-growing subpopulation in Hong Kong, made decisions on various childhood and adolescent vaccines for their offspring, and identified key influences affecting their decision making. Semi-structured in-depth interviews were conducted with 23 Chinese new immigrant mothers recruited by purposive sampling. All interviews were audio-taped, transcribed and analyzed using a Grounded Theory approach. Participants’ conversation revealed five underlying themes which influenced parents’ vaccination decision-making: (1) Institutional factors, (2) Insufficient vaccination knowledge and advice, (3) Affective impacts on motivation, (4) Vaccination barriers, and (5) Social influences. The role of social norms appeared overwhelmingly salient influencing parents’ vaccination decision making. Institutional factors shaped parent’s perceptions of vaccination necessity. Fear of vaccine-targeted diseases was a key motivating factor for parents adopting vaccination. Insufficient knowledge about vaccines and targeted diseases, lack of advice from health professionals and, if provided, suspicions regarding the motivations for such advice were common issues. Vaccination cost was a major barrier for many new immigrant parents. Social norms play a key role influencing parental vaccination decision-making. Insight gained from this study will help inform healthcare providers in vaccination communication and policymakers in future vaccination programme. Vaccination is among the most successful and cost-effective public health strategies for controlling a variety of communicable diseases . In Hong Kong, childhood vaccines are administered under two strategies. Most routine vaccines (B.C.G, Hepatitis B, Diphtheria, Pertussis and Tetanus (DPT), Polio, Pneumococcal, and Measles, Mumps & Rubella (MMR)), mandated under government’s Childhood Immunization Programme (CIP) are free to all local-born and resident children and administered according to standard schedules from birth in hospitals, throughout pre-school via the Department of Health (DH) Maternal and Child Health Centres (MCHCs), and into primary school years by DH outreach School Immunization Teams (SITs). Conversely, optional vaccines including Varicella, Haemophilus influenza type b, seasonal influenza A, Hepatitis A, Japanese encephalitis, Rotavirus, Meningococcal, and Human Papillomavirus (HPV) vaccines, are administrated on voluntary basis via primary care clinics the costs of which are fully or partially borne by recipients. Hong Kong has almost universal immunization coverage rates for mandated vaccines of 98% or above among local-born children and over 95% among Mainland-born children living in Hong Kong . These rates are higher than reported in many developed countries/regions [3, 4]. For instance, in 2010 only 72.7% of 19–35 month old children received all six USA government-recommended vaccines . However, in Hong Kong optional childhood vaccines have much lower uptake rates, being 32% and 15%, respectively among local-born 2-5-year-old children for varicella and seasonal influenza vaccination respectively, the most frequently adopted optional childhood vaccines . Despite Severe Acute Respiratory Syndrome (SARS) and the 2009 pandemic influenza (pA/H1N1) focusing attention on vaccination and how best to protect individuals during epidemics and/or pandemics , the actual uptake rate of novel 2009 pA/H1N1 influenza vaccine was only 1.1% among the Hong Kong general public , while no data are available about the pA/H1N1 vaccination rate among children. Increasingly microbial factors are implicated in noncommunicable diseases (NCDs) indicating growing possibilities for vaccination against adulthood NCDs . The recently introduced HPV vaccine is a typical example targeting young adolescent girls to prevent adult-onset cervical cancer . Nevertheless, since its 2006 launch in Hong Kong, only 2.4% of secondary school girls  have been vaccinated against HPV, compared to western countries where uptakes range between 17-81% . Parents mostly control young children’s access to vaccines, so understanding parental decision-making for their children’s vaccinations (VDM) is important. An extensive literature has identified factors promoting or inhibiting parents’ vaccination acceptance and decision-making. Principal influences are perceived severity and susceptibility of vaccine-preventable diseases (VPDs), beliefs about efficacy and safety of vaccines, and the cost of vaccination [11–15]. Additionally, social context, medical authorities (government, family doctors) and peers may also inform parental notions and attitudes about vaccines and VPDs related-risk [12, 15–20]. However, most existing studies are quantitative studies focusing on single vaccines, which limit understanding of how parental vaccination values and beliefs were shaped and interact, translating into vaccination decisions. Moreover, only fewer studies have involved minority groups in a community regarding parental VDM for children [21, 22]. No study we could find has combined all three of these features targeting Chinese migrants. Annually around 50,000 new immigrants from mainland China settle in Hong Kong presenting the most rapidly-growing subpopulation. Half of the migrants are adults, 90% of whom are female. Within Chinese culture, mothers remain the main caretakers of children and in most Hong Kong households make the family healthcare decisions, including vaccination decisions regarding their children . Therefore, our study focused on new immigrant mothers. This paper describes a qualitative study of new immigrant mothers from mainland China living in Hong Kong and examines the issues behind parental VDM to protect children’s current and future health. A qualitative study with individual in-depth interviews under a Grounded Theory approach was chosen because it allows for unconstrained study of the range and experiential aspects of target perceptions, behaviours and underlying issues [24, 25]. It attempts to avoid presumptions, thereby enabling a broad-brush picture of key concerns to emerge as the ground for theory building. It is most useful when either little is known, or there is a wish to minimize presumptions about the target behaviours. Ethnic Chinese women who migrated from Mainland China (a majority from Guangdong Province) to Hong Kong no more than 7 years ago (the minimum eligibility period for Hong Kong Special Administrative Region permanent residency), and have at least one child aged 14 years or younger living in a Hong Kong household were eligible for this study. These inclusion criteria gave an initial starting point for data collection. Participants were recruited using purposive sampling, where respondents meeting heterogeneous socio-demographic criteria are targeted to capture the richness of the phenomenon. Friends and acquaintances referred by the original interviewees where different beliefs and/or behavior/practice were noticed were also purposively included to help capture maximum diversity of opinion. Under Grounded Theory, data collection and data analysis run parallel in an iterative process. Using insights gained from ongoing data analysis, participants were further chosen based on particular characteristics, such as age, socio-economic background, education level, and children’s vaccination status, in order to achieve diversity and enhance understanding of various facets of the phenomenon being studied. Sample size was determined by data saturation (no new material emerging over three consecutive interviews). This study was approved by the Institutional Review Board of the University of Hong Kong/Hospital Authority, Hong Kong West Cluster. All participants were informed by the interviewer (LDLW, a female native Mandarin/Putonghua speaker from mainland China) about the study purpose and procedures, and right of uncontested withdrawal. After giving written informed consent, semi-structured individual in-depth interviews were conducted and digitally recorded. Interview locations were determined by participants for their privacy and convenience. Participants were initially asked whether their children had received all or some routine vaccines recommended by Hong Kong or mainland China governments, and to elaborate their choices. Participants were encouraged to discuss their attitudes and concerns regarding vaccination for their child(ren), and their sources of vaccination information. To improve insight into their attitudes and VDM, mothers were asked about various types of routine and optional vaccines including those for preventing childhood diseases (chickenpox and seasonal influenza), novel vaccines (2009 pA/H1N1 influenza), and HPV vaccine for adult-onset cancer prevention. The reasons why they decided for or against their children receiving a vaccine were explored using questions and prompts to encourage response elaboration. All interviews were conducted in Putonghua. Any medical concepts (such as pA/H1N1, HPV) were introduced in everyday language commonly used in local mass media. Interviews were performed concurrently with transcript analysis using constant comparative methods under Grounded Theory  to explore emergent themes in subsequent interviews. Data analysis under Grounded Theory has three coding stages. Data were first broken down by open coding whereby each event, idea or other element pertaining to a phenomenon, in each line of every transcript was labeled. Similar concepts were grouped and named into one category. Next axial coding was used to explore interrelationships between categories. Coded categories were specified into subcategories by identifying causal conditions, contexts, actions or consequences to build interconnections between categories. Finally, selective coding identified core categories associated with the research questions and their relationships with other categories wherein relevant findings of research interest were integrated and refined . To maximize analytic validity, two investigators (LDLW and WWTL) independently coded the data and held joint interpretive discussions. Disagreements were resolved by repeated textual reference, comparison and discussion, and, where necessary hierarchy re-assembly and re-coding. QSR NVivo 10 was used to facilitate the analytic process. Data analysis was based on original verbatim transcripts written in Chinese. The quotation in the Results section were presented in English after having been translated and back-translated using ethnographic principles to ensure equivalent meanings. Twenty-three new immigrant mothers participated between October 2011 to May 2012. Interviews lasted between ~30 to 80 minutes. Participants’ ages ranged from 27 to 50 years old (median 34 years). Fifteen (65%) participants were educated to secondary level, approximating to the 60% proportion of female new immigrants to Hong Kong aged 15+ achieving lower secondary as their highest education level . Sixteen participants had monthly family incomes below HK$14,070 (~US$1,800), the median monthly domestic income of new immigrant households in 2011 . Most participants were One-way Permit Holders who came to Hong Kong to join their husbands, a profile comparable to the general picture of female new immigrants in the 25-44 age group  (Table 1). 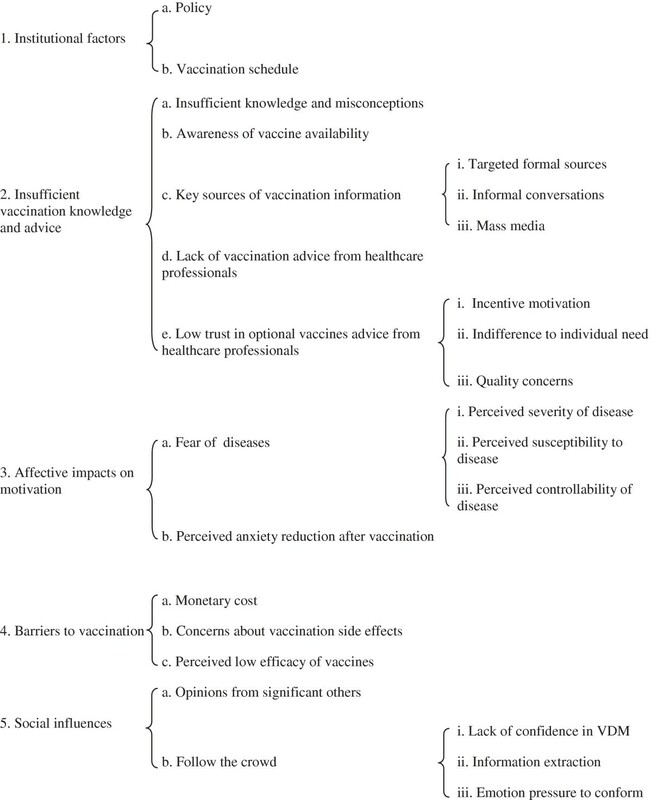 Overall, five major themes addressing parental VDM emerged: (1) Institutional factors, (2) Insufficient vaccination knowledge and advice, (3) Affective impacts on motivation, (4) Vaccination barriers, and (5) Social influences. Figure 1 depicts relationships between themes and categories. Because the study is designed to identify the spectrum of opinion, and not prevalence of opinion, the precise numbers and proportion of participants expressing each view are not provided, as these data are not meaningful in a non-randomized small qualitative study such as this. Excerpts from different respondents are used to illustrate the themes, categories and elements that emerged. They in no way reflect frequency of expressed opinion. For those readers curious about proportions of responses, we used the terms “few” for under five respondents, “several” for between 5-10, “majority” for 11-15, and “most” for 16-23. Hierarchical chart of themes and categories. Institutional factors capture vaccination-related factors influencing parents’ VDM stemming from the healthcare system, including policies and vaccination schedules. All participants were receptive to all routine vaccines mandated by either Hong Kong or mainland China governments. Because mainland China has had a childhood vaccination policy for several decades, study participants expressed unanimous confidence about the safety, efficacy and necessity of routine vaccinations in Hong Kong. In contrast, a minority of participating mothers had decided to reject all optional vaccines as unnecessary since they were not formally recommended by government agencies. School admission obliges children to be compliant with CIP coverage. This was a key driver for almost all participants. Similar to studies elsewhere , vaccines mandated for school entry strengthen parents’ perception that every child has to be vaccinated, which also somewhat mitigates parents’ concerns about vaccine safety. The explicit schedule for routine vaccination was considered important, driving parents to fulfill the social contract. Conversely, for many optional vaccines, for example HPV vaccine, the timing of vaccination was perceived by a majority of participant mothers as much more fluid and uncertain. In Hong Kong, the quadrivalent HPV vaccine is approved for 9-45-year-old women and the bivalent for women aged 10-45 years. This wide eligibility period confused some parents about the appropriate age for vaccination. Knowledge-related deficits were widespread and varied, and included misconceptions, ignorance and procedural uncertainties. Formal (for example DH websites) and informal (for example friends) information sources were used. Participants had poor knowledge and comprehension regarding VPDs, how vaccines work, and their administration. Although insufficient knowledge did not apparently hinder parents’ acceptance of routine childhood vaccination, ignorance surrounding optional, particularly newly introduced vaccines, is undesirable. Some respondents were unaware that vaccines are available for many common childhood diseases. Chickenpox vaccine, though available since 1995, was frequently mentioned. Despite government efforts in 2009-2010 to promote vaccination for children against 2009 pA/H1N1 influenza given the extremely low vaccination uptake, several mothers interviewed here were surprisingly unaware that the vaccine was available during the pandemic, despite already living in Hong Kong. Moreover, as the child gets older, following the CIP regimen of single and combination vaccines confused a few participant mothers about which vaccines had already been given and which not. So a proportion of these parents may fail to make informed decisions and some missed the opportunity for vaccination. The most commonly reported sources of vaccination information were targeted formal sources, informal conversations with peers, and mass media. Formal sources mainly comprised those from healthcare workers regarding routine vaccines, such as vaccination record cards for new-born babies from hospitals, and pamphlets from MCHCs. Leaflets from children’s schools also worked as reminders, or an indicator of “official” promotion, prompting parents to vaccinate children. For all participants, conversations, particularly among peers or fellow parents, were salient sources of information and consultation about optional vaccines. Television, newspapers, and internet (though several participants had access and necessary skills) were important sources of vaccination information. These sources not only promoted vaccination, but also provided adverse event reporting, apparently a more influential factor in parents’ acceptance of specific vaccines, particularly novel influenza pandemic vaccine. Similarly, several respondents reported ever receiving advice on optional vaccines from healthcare professionals. Some respondents also cited business-related explanations for why doctors seldom promote vaccination. Most attributed this to healthcare professionals’ lack of time, and avoidance of responsibility. Suspicions about motives were also raised in regard to doctors’ recommendations to take vaccination. Again financial gain was seen as a covert factor possibly influencing recommendations. A majority of participants distrusted advice about optional vaccines from healthcare professionals, doubting their motivation. A few participants felt that healthcare professionals recommended vaccines without carefully considering individual circumstances and needs, thereby discouraging parents who considered seeking vaccination advice from healthcare professionals. Compared to doctors in public healthcare settings, the quality of vaccines and safety of vaccination offered by private doctors were viewed with suspicion by a few participants, possibly because of reliability issues with some private clinics in Mainland China. Affect featured prominently in vaccination decision-making. Fear of the disease was balanced against possible reduction in worries after vaccination versus fearing the risk of vaccine-related harms. Among participants who vaccinated or intended to vaccinate their children with optional vaccines, anxiety was expressed about diseases perceived as severe and uncontrollable, to which their child was felt to be susceptible. Most participants believed that the mandated-vaccine preventable diseases were serious and justified vaccination. Regarding optional vaccines, fear of the vaccine-targeted disease was a key factor motivating parents to adopt vaccination for prevention. Parents who were receptive to vaccinating children with optional vaccines usually perceived their child (ren) to be susceptible to those diseases. In particular, participants perceived greater disease threat if someone they knew was affected. Participants who perceived low controllability regarding diseases prevention and treatment were more willing to vaccinate their child(ren). Conversely, parents who believed that VPDs are easily controlled and not so serious usually expressed less or no worry about those diseases, therefore being more inclined to reject the vaccine. Fear of the disease is a salient factor motivating parents to vaccinate children. Unsurprisingly, anticipated anxiety reduction after vaccination was a common emotional benefit since physical benefits usually cannot easily be foreseen. Monetary cost was an important inhibitor for several participants considering optional vaccines for children. A few participants from disadvantaged families rejected all optional vaccines due to the expense. High cost was one of the biggest barriers hindering participants who wanted to get HPV vaccination for their daughters. In contrast, the free provision of mandatory vaccination under CIP was one of the most important reasons for high immunization compliance. Concern about vaccination side effect significantly influenced parental VDM towards “new” vaccines. Several participant mothers didn’t immunize children with pA/H1N1 vaccine due to fear of its potential side effects, and a few participants in particular were concerned about the novel pA/H1N1 vaccine as a new product “hastily” developed in emergency circumstances without sufficient clinical trials. Several participant mothers felt that the HPV vaccine safety information was ambiguous leaving potentially unknown and long-term side effects. Misconceptions arising from confusing symptoms of influenza and the common cold (“flu”) , detracted from the perceived efficacy of influenza vaccination. Several participant mothers particularly doubted the claimed protection period for HPV vaccine if immunized when young. Opinions from significant others (family members, friends, healthcare workers) influenced parental VDM, particularly towards common vaccines. Observing peers’ choice as reference for VDM was common, particularly for new vaccines of perceived uncertain safety and efficacy. A majority of participant mothers tended to wait-and-see what peers’ choices were, often due to lack of confidence in making the right decision. When given the scenario by the interviewer of an optional vaccine, like HPV vaccine, being recommended by government, a few participants still said that they would wait to see what others do. By observing peers’ choice, parents assimilated relevant information and assessed the safety, effectiveness and necessity of vaccination. Several participants reported that they experienced or anticipated anxiety or distress, driving them to conform to group norms. The only participant who had vaccinated her child against 2009 pA/H1N1 highlighted the salient role of social influences during parental VDM and the negative consequences. It was common for respondents to express lack of confidence about choosing whether to vaccinate their child, particularly when the uncertainty and ambiguity surrounding vaccines and VPDs are high. These mothers instead often relied on two powerful psychological principles to help decide: authority and social validation . By following structured expert-based government vaccination programmes mothers can easily choose correctly without struggling with the issue themselves. In the absence of these, conforming to peers’ behaviour utilizes social validation to inform choice. Defined public health programmes like CIP and mandatory school entry requirements removed much uncertainty. All participants accepted CIP vaccines as necessary without explicit consideration, reflecting great trust in medical authority/government  and pragmatism (access to schooling). Obedience to authority/government is unusual in vaccine studies [31–33]. Chinese collectivist culture and traditional values respect social order, status hierarchies, and government policies . This effect also manifests in conformity with perceived peer group action to provide reassurance under conditions of risk uncertainty. Conversely, directives from medical authority/government on optional vaccines are implicit, placing responsibility on parents to decide. Under such circumstances parents’ VDM apparently relies on risk-benefit evaluations  for more familiar conditions, such as Chickenpox. However, novel or unfamiliar diseases and vaccines embody uncertain and ambiguous risks and benefits making vaccination decisions more difficult. Consequently, lay responses revert to reliance on heuristics, of which “imitate-the-majority” (bandwagoning [12, 15]) appears to be most commonly used . Meanwhile, no participant in our study mentioned herd immunity or adopted the heuristic of “free-riding” [12, 36] to guide VDM. By observing peer groups’ action, parents assimilated relevant information and assessed the safety, effectiveness and necessity of vaccination. This will result in many parents adopting a “wait-and-see-approach”. This can significantly impair the value of prophylactic vaccination programmes. Observing peer behaviour before acting probably also reflects conformity and harmony values in Chinese culture. Numerous previous studies on parents’ disease risk perceptions examined perceived severity of and susceptibility to the diseases [37, 38]. Our grounded theory study found that Chinese parents’ perception of VPDs relied on perceived susceptibility and severity, but also emphasized controllability, and anticipation of consequential affective elements as important influences. In particular, VPD-related worry or anxiety was a key factor motivating parents to vaccinate their children. Anticipated anxiety reduction after vaccination is a clear secondary benefit reinforcing vaccination uptake. The Risk-as-feeling hypothesis proposes that negative affect and cognitive risk evaluations are inter-correlated but divergently influencing decision-making . The affect heuristic further argues that feelings, as the emotional aspect of risk perception are as effective, and sometimes better than dispassionate cognitive risk evaluations for informing individual decision-making . The utility model proposes that the primary motivating factor for adopting preventive behavior is resolving the anxiety associated with the threat, rather than the threat itself . Monetary cost was confirmed as a major barrier to vaccination particularly for high-cost HPV vaccine, consistent with a recent systematic review . Here, this was particularly so among study participants who had low household incomes. Vaccination cost emerges as an important contributor to disparities in cervical cancer risk. Routine vaccines are free-of-charge. This is an important facilitator prompting parents to vaccination their children. Knowledge deficits about vaccines and VPDs appear widespread among new immigrant parents. Constraints on internet access were apparent. Lack of advice about optional vaccines from health professionals was commonly reported. In contrast to the trust in medical authority/government regarding routine vaccines, once direct payment was involved, trust was replaced by suspicion of pecuniary gain, with many parents doubting the motivation behind clinician’s recommendations on optional vaccines, particularly from private clinicians. This contrast is an important finding, illustrating how the public see direct payment distorting the motivations and hence advice from clinicians, and strongly points to a system which is free-at-the-point-of-care as most desirable: money damages trust in health care exchanges. Hence, there is a strong case here for government to issue targeted information and provide vaccination via MCHCs. Empirical studies suggest that people more trusting of formal information (e.g. from media, government, health professional) are more likely to adopt active health-protective behaviors [42, 43]. Impaired information communication between health professionals and new immigrant parents probably discourage parents from recommended action and encourage reliance on observing peer behaviour. This is undesirable for several reasons. Overall, social influence then appears crucial in parental VDM for immigrant Chinese mothers. Three reasons present themselves for the observed high-level of social norm influence in this study. First, study participants relied on limited and mostly informal sources of information. Informal conversation between peers helps to sustain normative group behaviours . Most other information sources involved one-way mass media, which has a tendency towards sensationalism. The limited sources of, and skills to access vaccination-related information restrict information for parental VDM. In this situation, the easiest, most convenient and valid way is to acquire information from observing other’s choices . Secondly, our study participants are all women, and women often show higher levels of group conformity than do men . Third, many participants have low socioeconomic status and may more readily accede to social norms through a greater sense of helplessness than people of higher socioeconomic status . We believe this is the first study on Chinese parental attitudes and decision-making for different childhood and adolescent vaccines. Using qualitative methods we have described parental vaccination decision-making and evidenced several important influences, some consistent with previous studies on European-originating populations but others that are distinctly different. Study limitations include snowball sampling (referrals from original interviewees), which can restrict sample heterogeneity. However, only a small portion of respondents were recruited this way. We particularly selected referred participants purposively on the basis of maximizing sample heterogeneity. Another possible limitation in interviewing mothers, those fathers’ roles may have been under-reported. However, most new immigrants are females and mothers usually are the main decision makers for children’s vaccination in this society (reflected in our present study). In other studies we have performed where we attempted to recruit fathers, they have shown no interest often referring us to their wife as the main health decision makers, reinforcing our belief that the mothers are the key informants to assess. Participants were mostly of low-to-middle-class socioeconomic status and new immigrants tend to take up less skillful jobs in Hong Kong or remain as housewives. Having median monthly household incomes of only 68.6% of that for all households , our study sample has characteristics comparable to those of new immigrant mothers generally. Moreover, the findings are consistent with earlier childhood vaccination decision-making studies in Hong Kong [42, 46]. So there is good reason to believe that this study presents a valid and reliable picture of the situation faced by many new-immigrant parents in Hong Kong. Mandating childhood vaccines by school entry effectively helps maintain universal vaccination coverage. Future public education and campaigns regarding optional vaccines should clarify necessity and provide explicit guidance. If vaccination is beneficial, there is a case for government provision, and if high uptake is required, vaccinations should be free of charge. Redesigned vaccination record cards could clarify increasingly complicated combination vaccine regimens. These might include both CIP vaccines and others available, with “Must, Should, Could” type recommendations. This would help more parents to make informed decisions and reduce reliance on herd responses. Increasing the channels for vaccination information delivery, concrete vaccination advice from health professionals, particularly public sector clinicians, and school leaflets, plus interactive communications, such as expert-lead community-based health education programmes, would facilitate parental acquisition of more accurate and timely information. Health professionals should attempt to strengthen the decision-makers’ preferred approach to a problem rather than replace it  to build trust. Financial cost is an important barrier to parental acceptance of costly optional vaccines, such as chickenpox and HPV vaccine. Policy options should include sliding scale vaccination subsidies to families, or, ideally, including all vaccines in the government-funded CIP. The Theory of Planned Behaviour (TPB) conceptualizes social influence as “subjective norm” reflecting perceived social pressure to comply from family members, friends, and healthcare providers . However, subjective norms only weakly predict intention , while descriptive norms (perceptions of what other people do) are a more substantive predictor of intention . There is medium-to-strong sample-weighted average correlation between descriptive norms and intention . Our findings indicated that descriptive norms appear more influential for parental VDM, particularly towards new vaccines. A reformulation of the social norm concept is needed in future studies of vaccination decision-making. In this study we explored how new immigrant mothers from mainland China who had settled in Hong Kong made decisions for children’s vaccination and factors influencing these. Overall, social norms play a key role influencing new immigrant mothers’ VDM, which is the most unique finding from our study. All participants unanimously showed high obedience to public health vaccination programmes, which is remarkably different from findings from studies elsewhere. In part this was a pragmatic decision to ensure their children could enter school uneventfully. Fear of vaccine-targeted diseases rather than dispassionate analysis towards the risk of diseases per se, was a key motivating factor for mothers adopting vaccines for children. Insufficient knowledge about vaccines and targeted diseases, lack of advice from health professionals and, if provided, suspicions regarding the motivations for such advice were common barrier issues. Vaccination cost was a major barrier for some, presumably poorer new immigrant families. Insight gained from this study will help inform healthcare providers develop vaccination communication and policymakers in future vaccination programme, but also have valuable implication for theoretical development on vaccination decision making studies. We thank the mothers who participated in the interviews. Thanks also to Hong Kong New Immigrant Service Association, International Social Service Hong Kong Branch, and United Christian Nethersole Community Health Service (UCN) for supporting us through help recruiting participants. LDLW contributed to the study design, prepared the research and ethics applications, data collection, data analysis, data interpretation and drafted the manuscript. WWTL contributed to the study design, data analysis, data interpretation, and amended the manuscript. JTW and QYL contributed to data interpretation and manuscript amendment. RF contributed to the study design, data interpretation, and critically amended the manuscript. All authors read and approved the final manuscript.